The generation of younger consumers makes up 21% of consumer discretionary purchases, which is estimated to be over a trillion dollars in direct buying power and a huge influence on older generations. 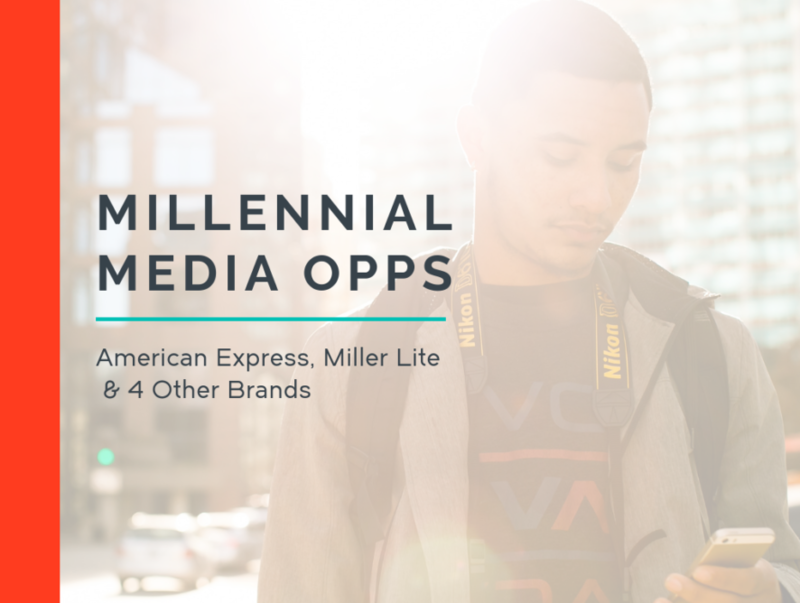 With this in mind, we’ve hand-picked six brands who are actively targeting the millennial demographic. The opportunities presented below vary from last-minute campaign dollars to brands that are currently planning their media spend. In an effort to reach the millennial audience, American Express has shifted its focus toward digital marketing in order to drive efficiency and channel optimization. Content personalization has also become a main investment for the company. After recently being promoted to Digital Engagement & Measurement VP, Arun Yang has led the charge assisting with these new media objectives. AmEx’s top spending period is typically Q4, with top channels of spend historically TV, digital, outdoor, experiential, print, radio and social. Roughly 50% of the company’s new customer base is made up of millennials. However, moves to begin targeting a Gen-Z audience are being made as well. Keep in mind the target demographic has a slight male skew. According to iSpot, a YTD national TV spend of $21.3 million has targeted millennials through programs such as Jimmy Kimmel Live, This Is Us, and The Tonight Show Starring Jimmy Fallon. Competition includes Universal McCann who picked up global media duties in October, mcgarrybowen with creative since 2017, and Digitas managing digital. In order to attract millennials, Yuengling released its first new beer in 17 years along with a new campaign in support. The Golden Pilsner campaign was created by Laughlin Constable, creative AOR. “Make Your Day Golden” will rollout across video, audio, outdoor, social and retail content. There should still be last minute dollars available from the campaign, so sellers are encouraged to reach out as soon as possible. Top spending period for the brand is typically H1, and keep in mind their millennial demographic also has a male skew. Yuengling spent national TV dollars for the first time last year with one spot via NBC Sports and Olympic Channel. The spot ran throughout July, so keep that possibility on your radar for the upcoming summer. In the past, Ashley Advertising and Havas have been responsible for media duties. Created by DDB Chi, Miller Lite’s most recent Game of Thrones-themed campaign takes a dig at Bud Light. “Aftermath” and “Snow” have rolled out across numerous TV, digital, and social channels. According to sources, Miller Lite’s planning and buying periods are typically Q1 and Q2, with the NCAA tournament being the brand’s largest advertising push of the year. Historical channels of investment include broadcast, experiential, digital, outdoor, print and social media channels in order to target their millennial demographic with a male skew. According to iSpot, YTD national TV spend totaled $19.7 million going towards male and sports-oriented programs. Adbeat reports within the past year the beer brand has spent $3 million on digital display ads, mostly site direct. Saint Archer, a craft brewer owned by MillerCoors, is testing its new beer, Saint Archer’s Gold, in four markets. In Austin, Indianapolis, Charlotte, and various Arizona cities. If the product is received well, it will become Saint Archer’s first nationally-distributed beer with a national rollout by 2020. To support the new product, Saint Archer worked with Preacher to roll out a campaign across earned and paid social channels, radio, outdoor, and in-store content. The target audience for the campaign includes 25-44-year-olds who want a craft beer they can consume over a longer period of time. Last minute revenue dollars should still be available throughout the campaign, so sellers should reach out soon to secure revenues. Keep in mind Saint Archer targets a millennial demographic with a health focus. Local sellers in the test market cities mentioned above will have the advantage. Keep the brand on your radar year-round since a top spending period has not yet been named. Sellers should expect a continued rise in spend from the emerging brand as it pursues national growth. Agency and martech readers are also encouraged to reach out for opportunities. In an effort to improve customer engagement, the National Association of Realtors bolsters their marketing team with the addition of PR & Communication Strategy VP Mantill Williams and Creative & Content Strategy VP Susan Welter, both effective in March. While personnel shifts typically signal reviews, Havas Boston has handled media since 2015 and it seems that creative and media are being brought under one roof. However, with the release of a recent campaign, there should be last minute dollars available, so sellers should reach out immediately. The brand has seen increased engagement among millennials, particularly after launching their new campaign. Recent decreases in spend should be reversed with the addition of new personnel and continued growth. Most increases will likely take place through digital and social channels that are most effective among millennials. After it’s review concluded in February, Humm Kombucha, who brews healthy and tasteful beverages, named North it’s new AOR. The agency will oversee brand strategy, creative strategy paid media and influence execution as well. North’s first work featured people’s initial expressions when trying the drink, released at the end of March. Media sellers- opportunity still exists to secure revenue from this initiative, so we recommend reaching out as soon as possible. With no top spending period established, this brand is one to reach out to year-round for revenue. Keep in mind they appeal to millennials, particularly ones with an interest in organic and health-focused products. The brand has historically used earned media and social media, as well are local marketing surrounding its taproom in Oregon.